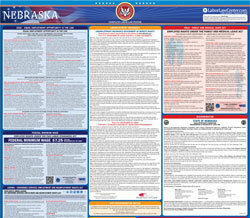 The Discrimination in Employment, Housing, and Public Accommodations is Prohibited by State Law is an equal opportunity law poster by the Nebraska Department Of Labor. This is a mandatory posting for all employers in Nebraska, and businesses who fail to comply may be subject to fines or sanctions. This poster must be posted in a conspicuous place where all employees, customers, potential and current renters and occupants will see it. This poster describes unlawful discrimination in employment, housing, and public accommodations as well as how to file a complaint for being discriminated against and the protections available for those against retaliation costumers and employees have. It appears you don't have a PDF plugin for this browser. Please see the link below to download nebraska-eoc.pdf.